Have you ever thought, “Boy, I wish someone would write a book that brought together all the great reading instruction strategies I have encountered over the years?” Good News! The book is here, written by former teacher, and current literacy consultant, Jennifer Serravallo and entitled, The Reading Strategies Book: Your Everything Guide to Developing Skilled Readers. The title tells you the story. This is the most complete, best informed collection of reading instruction strategies I have ever seen. Three words, I think, best sum up this book: informed, comprehensive and practical. The book is informed by the best of research, theory and practice in the field. Serravallo spent many years working as a staff developer at Columbia’s Teachers College Reading and Writing Project under Lucy Calkins, so it is not surprising that this book integrates many strategies around Calkins workshop approach, but many other major contributors to our understanding of literacy instruction are also well-represented. These include Marie Clay (early literacy), Irene Fountas and Gay Su Pinnell (guided reading), Ken Goodman (miscue analysis), Regie Routman (Invitations), Stephanie Harvey and Anne Goudvis (comprehension strategies), Ellin Keene (text connections), Michael Smith and Jeff Wilhelm (middle school readers), Richard Allington (reader engagement), and even including sound advice on the Common Core touted close reading from Christopher Lehman and Kate Roberts. In fact, think of a book on literacy you’ve read, or wished you had read, over the past 20 years and it is likely represented here. 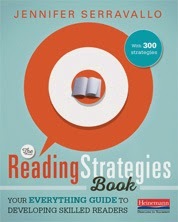 The book is comprehensive in that it includes strategies for teaching readers from kindergarten through grade 8, not in a lock step manner, but in a way that helps the teacher choose what strategy is right for a given group of readers based on what the readers know and are able to do, rather than on what grade they are in. Further, every aspect of reading instruction is addressed from emergent reading, to print work, to fluency, to comprehension of fiction and non-fiction, to reader engagement, to writing about reading. It also provides multiple instructional strategies for whatever you wish to target in your instruction whether it be monitoring for comprehension, decoding, developing fluency, determining importance, inferring, or supporting student conversations. Perhaps most importantly, the book is practical. I must say that reading it warmed my pragmatic little heart. In her introduction, Serravallo says the book was patterned after Chef Mark Bittman’s, How to Cook Everything, a book that has an honored place on my shelves. Serravallo has organized the book like the best cook book you can imagine. It is no exaggeration to say that a teacher could pick up this book today and start cooking teaching with it tomorrow. Each chapter is organized around thirteen goals that Serravallo has organized to allow the teacher to choose the goal that is right for the developing reader in her classroom. Within each goal based chapter are the skills students need to achieve the goals and then specific strategies teachers can use to help students. And best of all, each and every one of those strategies is one page and each and every one of those pages is a piece of instructional nirvana for the harried teacher. On these strategy pages Serravallo shows that she is an experienced teacher and teacher developer who knows good instruction and knows how to help teachers apply good instruction. Besides an explanation of the strategy, each strategy page might contain a Teaching Tip, Lesson Language, Teaching Prompts, and a visual to help the teacher see what the instruction might look like in the classroom. The Lesson Language shows how Serravallo might explain or demonstrate a strategy. The Prompts will surely help the teacher guide student learning and probe student understanding. Many of the visuals might well become anchor charts in the classroom. Each page also contains marginal notes that will help the teacher decide what level reader the strategy is designed for, as well as the genre/text type to use with the strategy and the skills that are being addressed. A Hat Tip box tells you from what source the strategy was adapted. Whether a teacher is working in a workshop instructional model, a guided reading/literacy center model, a basal reader/anthology model or a Daily 5 model, this book will fit very nicely into the instructional framework. For teachers stuck with a prescribed scope and sequence for instruction, this book will help the teacher meet the needs of those students who don’t fit neatly into a rigid instructional design. My advice: beg, borrow or steal this book now. If your budget only allows for one book to support your literacy instruction for the next school year, this is the one. Serravallo, Jennifer. (2015) The Reading Strategies Book: Your Everything Guide to Developing Skilled Readers. Portsmouth, NH. Heinemann.